Kept in British Museum, London, England. Former collection of Sir Hans Sloane. This painting shows the meeting of Shah 'Abbas I of Iran (1571–1629) and Khan 'Alam, the ambassador of Mughal India, at the former Safavid capital, Qazvin in 1618. 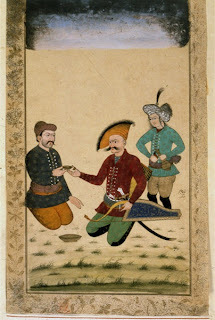 Their meeting was recorded by a Mughal court artist, and this image is most likely based on one of the preparatory painted sketches made of the key figures. Mughal India was Iran’s largest trading partner, supplying textiles, spices and other merchandise. Indian goods reached Iran in such quantities that Iran was constantly in need of silver to pay for its imports. To ensure the continuous flow of commerce Iran and India exchanged many ambassadors. Despite this close relationship, the Mughal ruler Jahangir wanted a visual record of his ambassador’s meeting with Shah 'Abbas and sent his leading court artist Bishn Das to paint the shah, his courtiers and the meetings that took place. Later versions of this painting, including the one shown here, reveal how the original painting achieved iconic status in the art of the Muslim courts of India, and how interest in the meeting continued long after the event. This painting is from an album that entered the British Museum in 1753 with the collection of the museum’s founder, Sir Hans Sloane. The album also contains portraits of the most illustrious sultans of the Deccan (central and southern India) and of Mughal India, as well as a portrait of Shahs 'Abbas II and Sulayman of Iran who ruled from 1642 to 1694.